Here is a quick edit of the project car. 1994 Integra LS with a JDM itr Swap. Bride seats, lowered o DNA coilers. TSW wheel. This is my 1994 Dc4 Ls. I have done a few things but she is my daily driver. I bought this car shortly after I had my GSR stolen. My Dc4 is name is Annie and she is a huge part of my life. I plan to keep her as I save for my next car. She'll be my race car someday. Sorry to hear about your old GSR but I'm glad that did not stop you from enjoying what you like. Good luck with Annie. Thanks for submitting the pics and for your support. Sorry I don't know how I missed this one. I uploaded the pics but somehow it was never published. Never the less here it is. Bonnies CRX. Rexy is a 2005 Acura RSX owned by Devin. She has been with this car for 5 years now., and the love shows. Unfortunately due to New York roads Rexy has gone through 5 front bumpers. New York roads are just rough of cars. Rexy just got a fresh coat of silver with red pearl, rolling on XXR wheels. I just love the carbon accents on the car. Keep up the good work Devin. Rexy is in good hands. Meet Howard. Jaimie's Minty Green DC2. Howard started life as a Gray 1994 Acura Integra LS. The proud owner has been working on him for the past year. Her plans is to eventually turn Howard into a drag car. This is a clean example of a 79 VW Rabbit or know in the VW world as MK1. The best part is that this Rabbit is a Diesel model. Great looking daily driver that gets great gas milage. What more can you ask for. Tom her husband did all the work on this car himself. He took pride and joy making sure no small detail is missed. More inside and to see the build process. 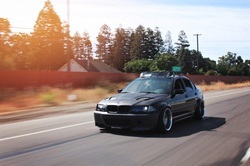 Doms clean E46 is his daily drive, and I mean he drives this thing. Doesn't matter whats he occasion he jumps in this and drives it. Picking up hugs parts 600 miles away? No problem. Drives it. Read more for the specs and pics. What happens when you grow up around your dad that loves cars? Well you grow up loving cars and have a great taste when building one. Thats just exactly what Juliana did. She bought this clean EG hatch 2 years ago. It was bone stock. First order of business, get that thing down on the ground. So out goes the stock suspension and in goes a full coil over set. Well she can't roll around on a slammed car and not have rims. So she slapped on a set of Enkeis 92s. Then once the stance is set, she focused on the little things. Such as Password JDM duck bill, JDM fog lights and control arms. She gutted the interior for light weight, not that EGs are heavy, but lighter the better. As for power plant she decided to swap in a European H22 TypeR. Cause it aint a tight car if it don't have a Type R. Keeping the motor at bay is a set of HASport mount kit, Axles. Her father raised her well. When she wants to do something, she do it right. She said she is not finish with the car. She wants to build it and make it everything she could dream of. Well I say she is on the right pace and Juliana and her car are going places. Keep it up. If BMW would have made the E46 M3 in a sedan platform, I would have probably looked this good. But too bad they didn't. But that did not stop JeppeJ from making his own E46 M3 Sedan. All it took was a E46 sedan and a very clean example of E46 M3 Coupe. The project took over a year to perform, but He did all the mechanical work himself. In the end he ended up with this very clean M3 sedan. what a pride and joy.